Global anti-aging specific skincare, smoothing, redensifying and moisturizing. Prevents and minimizes all visible signs of skin aging. A powerful cocktail of active ingredients preventing and reducing cutaneous slackening, wrinkles, dull complexion, loss of moisture and elasticity, for each type of skin starting from 30 years of age. Created for combination, normal and dry skin, even for the most sensitive or postmenopausal skin. Use it daily on your face, day and / or night (better). Smooth cream, rich in active ingredients. Its fragrance evokes a floral bouquet which disappears after the application. Use lift EFFECT® daily on your face, neck and neckline, on clean and dry skin, using light circular movements (see suggested application method below). Ages 30 and older: : A single application of lift EFFECT® each day is enough to correct and prevent the first age-related imperfections. Ages 45 and older: Apply lift EFFECT® morning and night to maintain even, smooth and replumped skin. Intense nourishing action: You can use the lift EFFECT® combined with hydrate EFFECT® for deeper moisturizing and nourishing care. Thanks to the primrose, borage, avocado oils and shea butter, your skin will be well hydrated for long-lasting comfort. Intense anti-wrinkle action: You can use the lift EFFECT® product combined with the mask EFFECT® skin care for remedial and anti-redness effects. Thanks to the combination of zinc oxide and butterfly lavender extract, this synergy reduces spots and imperfections, for smooth, even-looking skin. Enhancing action: You can use the lift EFFECT® product combined with the mask EFFECT® skincare to a remedial and anti-redness actions. Thanks to the combination of zinc oxyde and butterfly lavender extract, this synergy reduces spots and imperfections, for a smooth and homogeneous skin. Use the skin care product daily on the face, neck and neckline, day and / or night, on clean and dry skin, using gentle movements, starting between the eyebrows and smoothing upwards onto the forehead. Smooth over the cheekbones towards the temples and use circular movements over cheeks and the face contour. Starting just above the eyebrow arches, press and smooth along the eyebrows 3 times. Press lightly 3 times on Point 6, on the temples. A few seconds after applying the lift EFFECT® product, your face will feel smoother, free of residue and shine. Immediately comfortable, your skin is rejuvenated and nourished thanks to the samphire extract, aloe vera and other selected oils, providing a persistent effect lasting 3 to 7 days. The combination of white tea and red ginseng has an anti-fatigue action intensified by relaxation of facial features and reduction of water loss. Your skin is moisturized, nourished, unified, smoother and the feel of the face seems redesigned. Wrinkles are reduced until fine lines vanish thanks to efficacy of the lavender and Criste Marine extracts. One hour after application, wrinkles are repaired, the multiplication of skin cells is stimulated and the stratum corneum is naturally exfoliated, reducing epidermal imperfections (such as pregnancy mask or brown spots). This rehydrating skin care product does not cause irritation (unlike retinol), restoring radiance to your complexion and reducing new wrinkles. 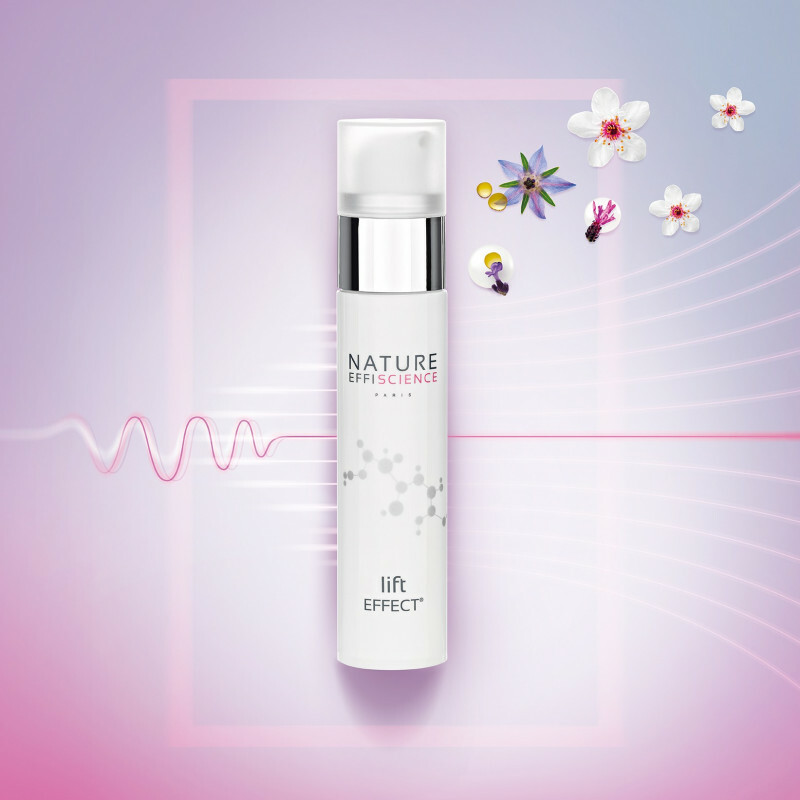 lift EFFECT® is a global anti-aging skincare, treating at the same time appearance of wrinkles, redensification, skin firming, while providing hydration for dehydrated and mature skins. Your skin recovers its glow and softness. This product has been tested under dermatological control and there were no visible skin reactions. lift EFFECT® contains no parabens, phtalates, mineral oils, monoethanolamine (MEA), diethanolamine (DEA), triethanolamine, silicone or animal ingredients. 76% of the formula is made from organic agriculture. Its concentration in organic ingredients is 7 times higher than the Ecocert requirement for organic certification. Our product is ethical; neither the ingredients nor the finished product are tested on animals. Avocado oil: Nourishing and anti-aging. Apricot oil: Anti-aging and toning. Stimulating collagen synthesis and improving elasticity and suppleness of your skin. Anti-oxidizing effect, Anti-free radical action.